Gingerbread is one of my favorite things to bake during the holiday season! Not only is it delicious, it makes your kitchen smell amazing! Every year I make gingerbread cookies, and sometimes I make something else gingerbread flavored, like this cake. 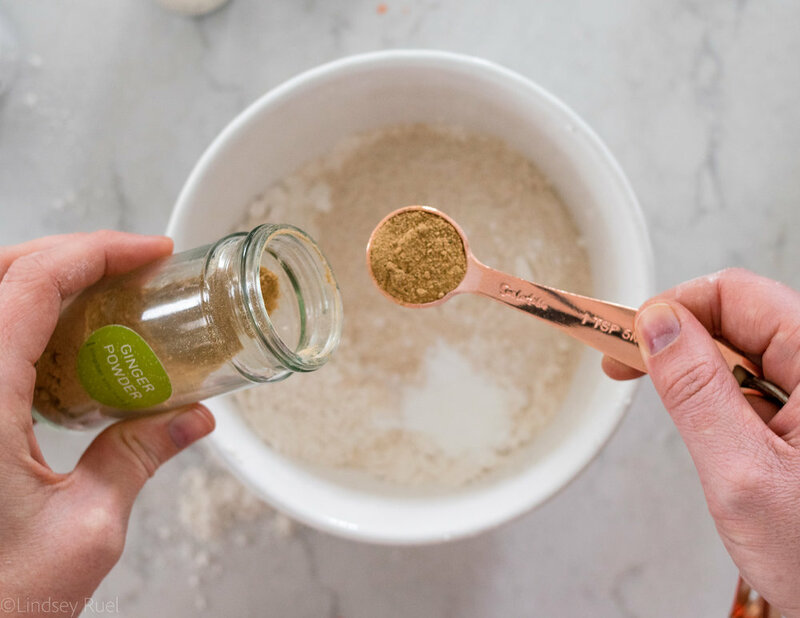 This year, I wanted to make something a bit more practical and easy to make, considering I will be taking care of a newborn for part of the holiday season, and these gingerbread muffins are the perfect compromise. They are delicious, they make my kitchen smell wonderful, they are easy to make, and I can freeze the extras to eat later! And when they are topped with a cream cheese frosting, they are perfect for any breakfast, whether it’s on the go or surrounded by family! Most of the flavor in these muffins comes from the spices, so make sure you are using good, fresh spices. Combine the ginger, cinnamon, and glove with the flour (in this case I used all purpose and whole wheat), baking soda, baking powder, and salt. Then give it a good whisk to combine everything together and break up any clumps. 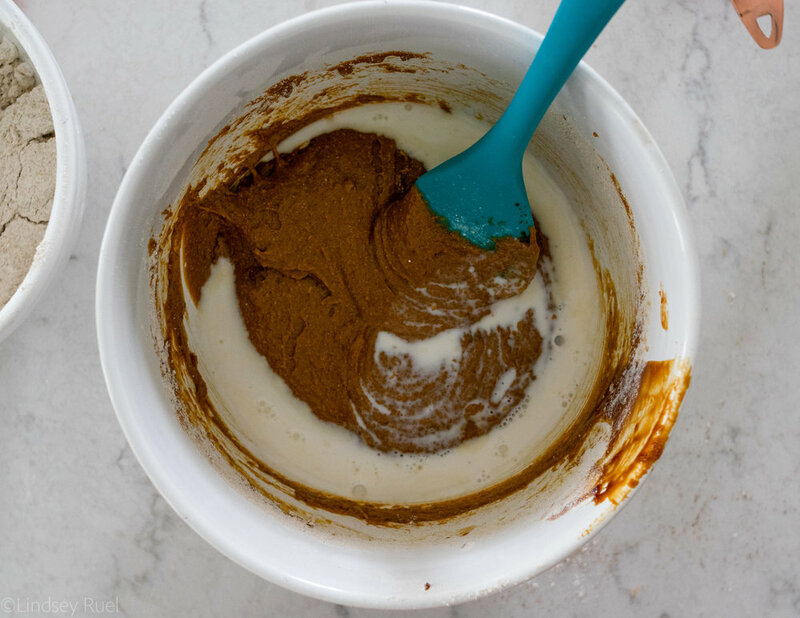 In a separate bowl, combine brown sugar, molasses, and melted butter. Stir everything together then add in the eggs. Alternate adding in the dry and wet ingredients. First mix in half of the flour mixture. 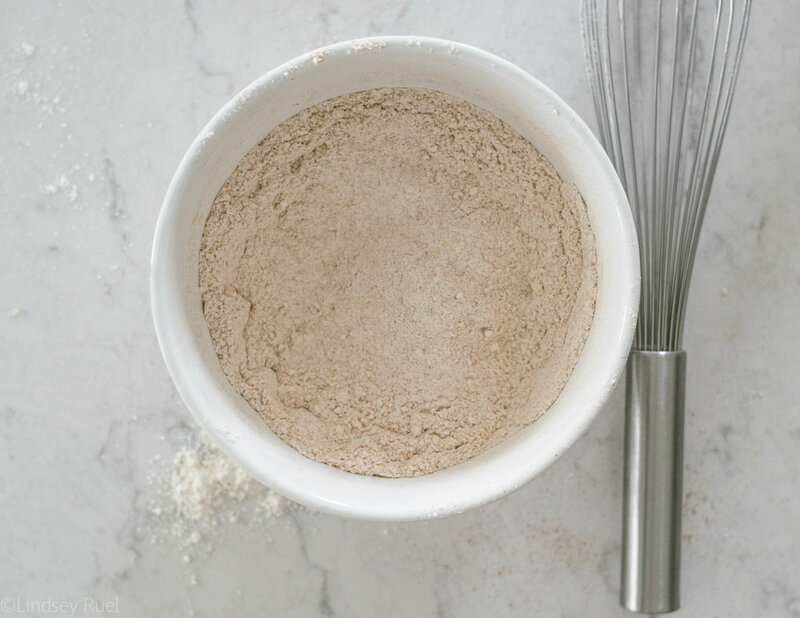 Then stir in all of the milk/vinegar mixture, then the rest of the flour until it’s just barely combined and you can no longer see any streaks of flour. Portion the batter into the muffin tins and then bake for 20-25 minutes. If you want to add a little something extra on top of these muffins, then you can combine cream cheese, butter, milk, and powdered sugar to make a delicious cream cheese frosting. The cream cheese frosting, all though minimal, takes these gingerbread muffins from being delicious to being decadent. And we all deserve something decadent over the holidays, right? 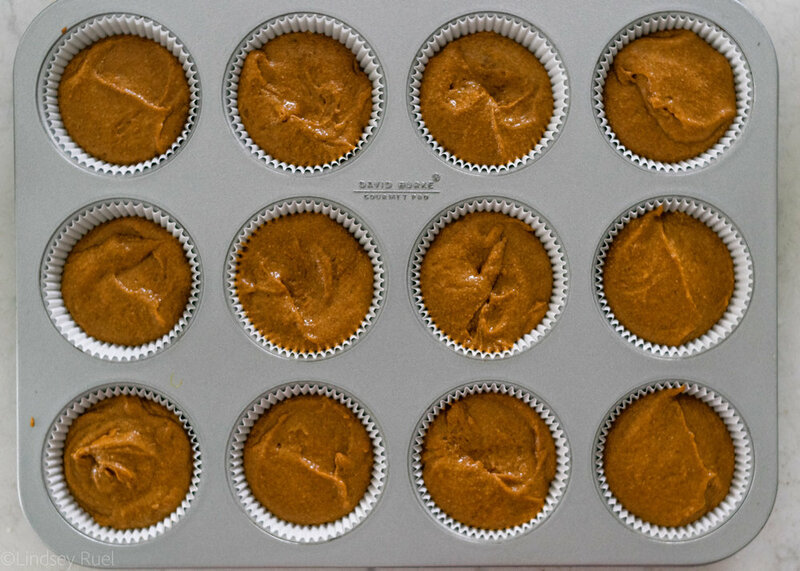 Preheat oven to 350 degrees and line a muffin tin with muffin tin liners. Set aside. 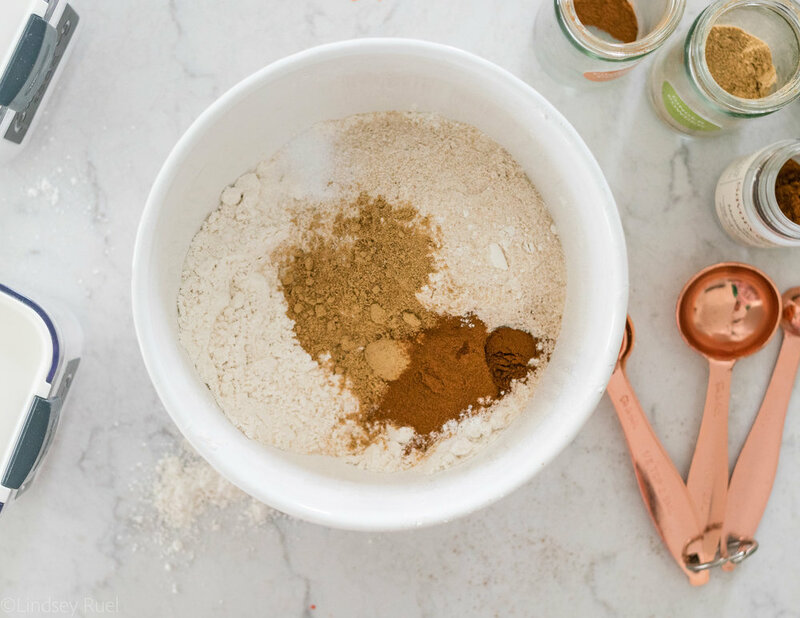 In a large bowl, whisk together flours, ginger, cinnamon, clover, baking powder, baking soda, and salt. Set aside. 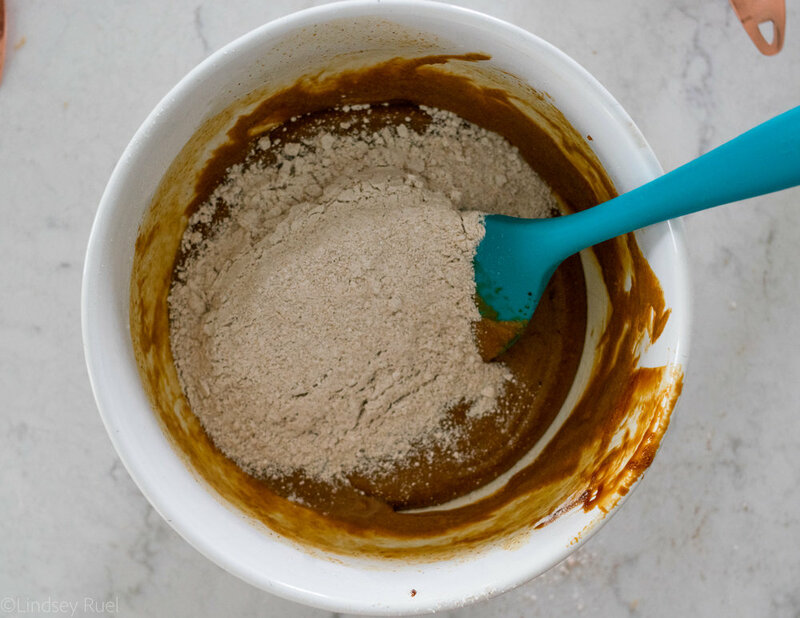 In a separate large bowl, mix together butter, brown sugar, molasses, and eggs until well incorporated. Pour the apple cider vinegar into the milk and stir. Mix in half of the flour mixture into the butter and sugar mixture until barely combined. Pour in milk and mix. Then add in remaining flour mixture and mix until all the flour is just incorporated. Don’t over mix. Use an ice cream scoop to portion the batter between the muffin tins. Bake for 20-25 minutes, or until a toothpick inserted into the center comes out clean. Meanwhile, mix together all the frosting ingredients until you have a thin cream cheese frosting, approximately the consistency of cinnamon roll frosting. After muffins have cooled for at least 5 minutes, spread frosting on top of the muffins.